The numbers on Cromford Hill have changed, so which house today used to be No 54? George describes living in 54 in 1930. Maureen, after much research, has found that the house number was changed to 58 in 1965, and supplied a photo of how it looks today (2007). The outstanding feature of Cromford village are its "Arkwright" houses, which line both sides of Cromford Hill and North Street and are all built to a standard plan. These were solidly built 1771-76 of the local Gritstone, possibly taken from Barrel Edge Quarry. The original houses built in the 18th century were mostly three storey with a weaving gallery in the top floor. The windows would have been large to admit as much light as possible but many of these have been reduced in size. Also, the window frames were originally of cast iron with many small panes of glass in leaded lights. Taken 1930-35, when it was called Number 54. Whilst I was born in June of 1926 I remember nothing of my early time at Normanton and my first memories are of Cromford. I must have been around two years old when the rest of the family moved to Cromford. Dad had arrived some time earlier and was in lodgings with an elderly couple, Mr and Mrs Marples of Rise End Middleton. My first recollections were of our house at Addison Square half way up the main part of Cromford Hill on the route to Wirksworth. It was, I believe, a council house of fairly recent construction and had a reasonable amount of garden for the area. 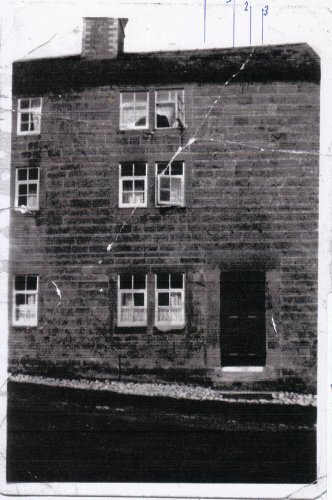 We were destined not to occupy that house for long and within months we had moved to No 54 The Hill, Cromford, only a hundred yards or so higher up the hill. It was cheaper and although may not have been as large as the earlier house, it was three storied and possibly had the odd room extra which was more suited to a large family. There was no running water laid on, lighting was by gas and cooking had to be done over a coal fired range which had an oven and a tank for heating water on the opposite side to the oven. There was a drain but no toilet sanitation except for the outside closet at the bottom of the small yard. Cold water was only available from a tap across the road from the house. In the small ‘kitchen’ there was a large half circle copper under which a fire had to be lit every Monday morning as washing was not done on any other day in those times, water was carried across the road and then all the clothes were boiled. It was quite a ritual for a small boy, then the drying and ironing had to be done. Please notice the whiteness of the front step!! My mother used to holystone that every Saturday morning without fail, rain or shine or snow, we kids, five of us (at that time) were kicked out to play while she cleaned all Saturday morning. ...you will find four holes in the wall. Three in a triangle shape in the area just above the front door and the fourth just to the right of the centre of the middle window. ...the drilled holes (all you will notice are through the mortar lines and not the stone) are exactly located to support a sign with a longer steadying bar. I understand ...the house [opposite] used to be a Public House. What did our house use to be?